Donate your new and gently used sports equipment to a great cause. Do you have [enter any sports name] equipment from that one time your child really, really wanted to play but decided after a few practices that it was the worst? Maybe your kiddo had a real passion for the game and has outgrown more pieces of equipment than you can count (and they’re all crammed in the garage)? We’ve got the solution for you. 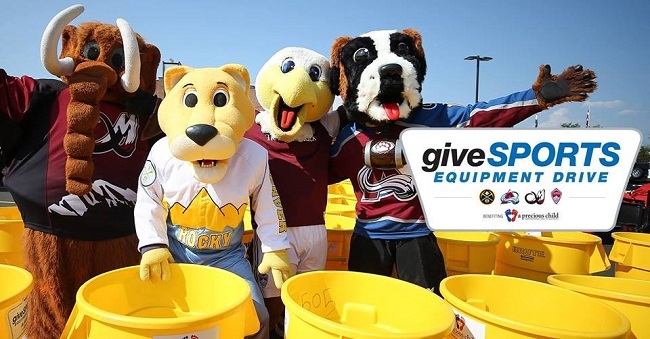 The 7th Annual giveSPORTS Equipment Drive will be held at Pepsi Center on Saturday, Sept. 8 from 9-11:30 a.m. in the Rav4 Parking Lot. Clean out your closets and drop off new and gently used sports equipment, or monetary donations, during the event. Representatives from the Colorado Avalanche, Colorado Mammoth, Colorado Rapids, and Denver Nuggets will also be on hand to meet and greet. The event is hosted by A Precious Child in partnership with Kroenke Sports Charities. All the items and money collected will go to A Precious Child's giveSPORTS program, which provides sports equipment and scholarships to kids in need. “Extracurricular activities are expensive and become an unattainable dream for children in need due to the already stretched budgets of their families. Children who have the opportunity to play sports learn many life lessons such as teamwork, leadership, sportsmanship, responsibility, ethics, time management, how to strive to win and how to deal with losing, which all translate into the classroom and one day into their careers,” relates A Precious Child. Through the program, children can submit a scholarship application for any sport to help cover the cost of registration and other sports-related fees. The 2017 event collected a record-breaking 26,137 pieces of equipment and $16,200 in monetary donations. Bring your items down to the Pepsi center on Sept. 8, and let’s blow last year’s record out of the water! Next time you're at Mile High, try the new BBQ Thunder Dog!